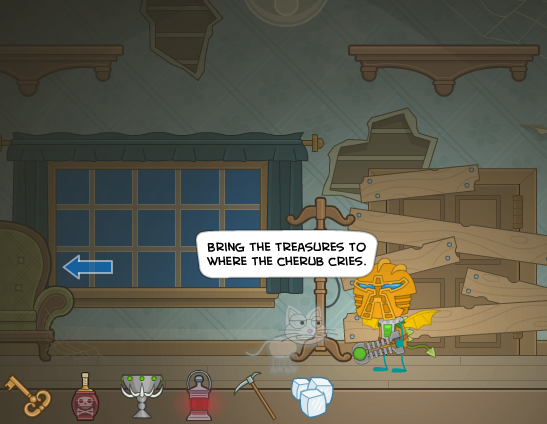 The Haunted House quest on Poptropica, which was only around for Halloween, is here to stay! 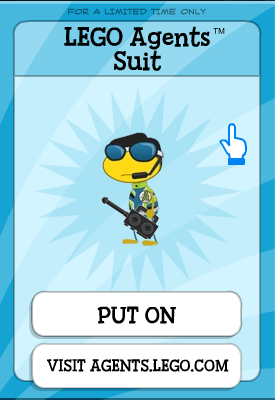 The button on the map has disappeared, but you can get a special teleport card in the Poptropica store. And the best part is, it’s free! Hurry and get it though, because I have a feeling it won’t stick around for ever. With it, you can visit the Haunted House anytime you want. I have a feeling there will be more teleport cards to come, but I can guarantee you that they won’t be free. Don’t forget to read my original Haunted House post if you haven’t already. That’s gotta be the best post title ever. I normally don’t like writing about Poptropica things, but I enjoyed this advertisement building so much I wanted to post about it. It’s about a new Bionicle (you know those LEGO-that-ins’t-lego things?) series. A bit harsh. But the weighing scales know all. Figure it out for yourself. I find it more satisfying when you do it without help. If you really do get stuck, go to an island that lets you fly (Early Poptropica, Super Power) and then just fly over the enemies. 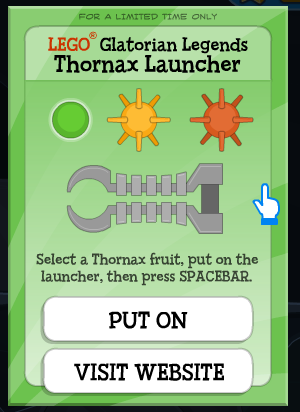 The Thornax Launcher is a handheld item. When you press spacebar is shoots whichever ball you have equipped: there’s a green one, a red one with spikes or a yellow one with spikes. 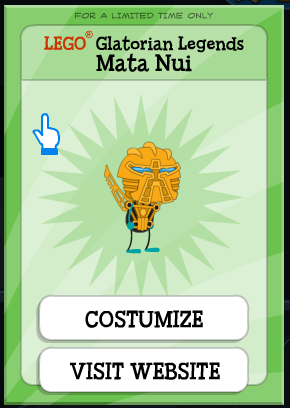 The Mata Nui costume can be Costumized. It makes a pretty cool space suit if you’re playing Astroknights. And let me once again rant about the way all advertisement items disappear after a while. I think that the Creators should make a new island for all the advertisement buildings, but you can only wear the items gained from them on that island. Maybe they could make it an island where you can only go to if you buy a ticket from the Credit Store. If the company doesn’t want the ad to remain, they can remove all traces of the product from that building and item(s) e.g. 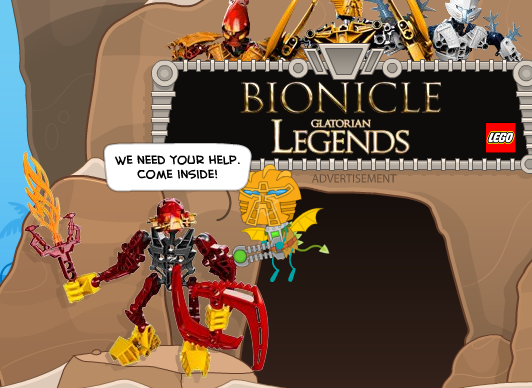 get rid of the Bionicles and the trademarked named from the current advertisement and just make it into a generic get some water for a dude adventure. In fact, if they did that with all of the advertisement buildings, they could make a whole new island without that much effort. It could always be growing; each time a new advertisement is retired it gets added. Plus (now this is just me personally) even though I hate buying credits I’d definitely do it for that island. OH YEAH AND THEY NEED TO REMOVE THOSE STUPID AGE/GENDER RESTRICTIONS. GAWD. Comment what you think of my idea. 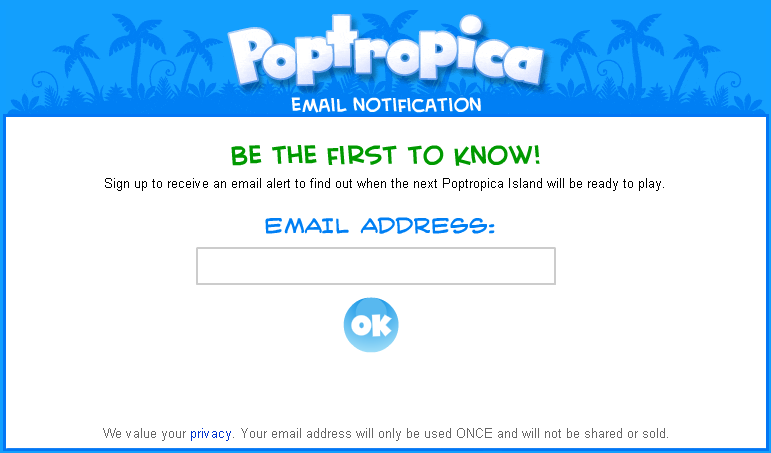 If you want to talk about this new advertisement, or Poptropica in general, please go to the Poptropica Discussion Page instead of clogging up this post. In other news: Wow, the new WordPress spell checker is brilliant! It really is as good as Microsoft Word. There’s a new advertisement on Poptropica! It’s one of the best so far. There are two Lego mini-adventures to play. They’re pretty fun. In the ‘Lego Agents’ one, you just have to dodge the lasers & steal Dr. Inferno’s laptop. Then you run away from the guards & jump in the getaway car (you need to collect a box of Lego to build it first, though). At the end you get a Lego Agents Costume. Which reminds me, there are two new banners on the Poptropica home page for the two new islands. Big Nate Island actually looks quite interesting. It’s a shame the actual comic strip is that bad. Don’t forget to visit the Poptropica Discussion Page, where you can talk about Poptropica with other fans! Yup, you read correctly, Spy Island is out! It’s an awesome island. Very tricky. 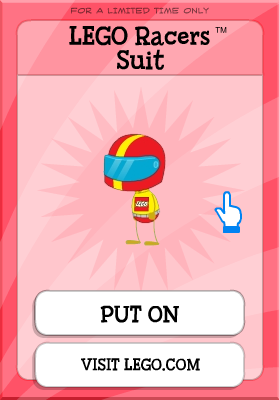 There are loads of cool new items, like the Chameleon Suit, or the Grappling Bowtie. Your mission is to free the three top spies who have been captured. Remember to look for other spies who give you clues on what to do next, or even secret messages! Once you complete this island you become the new director of the spies! Remember, if you want to discuss Poptropica with other fans, please use the Poptropica Discussion Page, not this post. 24 Carrot finally comes out. The Race to the Bowl starts. If you win you got a costume that lets you run really fast & a trophy. You can also get Team Apple & CinnaMon shirts. The Costumizer tool comes out. Now you can copy any item from NPCs! (Apart from handheld items.) This then replaces the old ‘Friends’ button at the top of the screen. The Race to the Bowl ends. Team CinnaMon won. Super Power Island comes out. Nim’s Island Activity Centres appear all over Poptropica. You can get two costumes in there. One looks like Indiana Jones. ‘Don’t just go Back, Arrive’ videos spring up all over the place. It seems to be an advertisement for new ‘Back to school’ clothes. Weird. When 24 Carrot came out, the Race to the Bowl was leaked. It was removed though, & then re-added a few days afterwards. 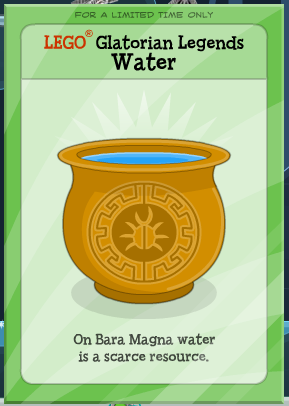 A bonus item came out after Super Power was released. It was a chalice you held in your hand. It was hidden on top of a shark statue at Booga Bay on Shark Tooth. It was changed a few days afterwards to black sunglasses for some reason. All chalices disappeared. You can find the sunglasses on top of the big building on Time Tangled (not Party Time Tower, the other one behind the lab). Just a few days ago, a guy appeared outside all remaining Nim’s Island Activity Centres, dressed in the Indiana Jones clothes. He tells you to go inside to learn more about Nim’s Island. The ‘Don’t Just Go Back, Arrive’ videos have disappeared… but the Lounge is still there.